Get your haunted house or haunted attraction listed in our directory or upgrade your free listing so that more of your haunt's details will appear on our site! Please fill out the form below and we'll get you set up shortly. HOW VOTING WORKS: all votes are cast by our web site visitors. 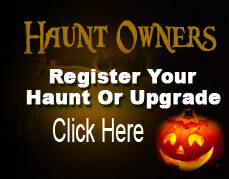 We do not rate haunted houses or visit and review them; our web site visitors do! You can increase your rating by encouraging your "victims" to vote for your haunted house! A rating of zero simply means that no one has voted for that house yet. ALL VOTES ARE RESET ON SEPTEMPBER 1st OF EACH YEAR. Which area best describes your haunted house or haunted attraction? My haunted house is already listed but I want to upgrade my listing and get a username & password! How did you discover HauntedHouseRatings.com?